The 30-room Brown Hotel opened in late 2010 as Israel’s only member of Design Hotels and remains the hippest of Tel Aviv’s boutique hostelries. A converted bank, it takes its name and decor inspiration from the West Coast of the 1970’s – all chocolate and orange, with mellow sounds on permanent play and some great vintage furniture. 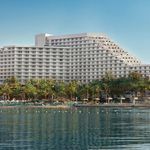 The hotel is interestingly located at the epicentre of a triangle bounded by Tel Aviv’s most happening neighbourhoods, all within 10 minutes’ walking distance. Rooms are small but perfectly formed, with some larger accommodations available at a premium. 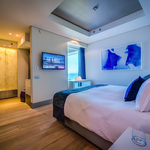 All enjoy flatscreen TV’s, complimentary wi-fi, multi-line telephones and laptop-sized safes, as well as luxuriant Egyptian cotton bedlinen and towels. Breakfast is a great innovation. Instead of serving on the premises, the Brown chooses to showcase restaurants in the three fascinating but very different neigbourhoods which surround it – romantic Neve Tzedek, hip Rothschild Boulevard and edgy Nahalat Binyamin. Guests take their pick at no charge, getting a great chance to breakfast with locals, and it will almost be a shame if plans to serve breakfast on the hotel premises in future are realised. This is a hotel which makes up for its small rooms with some interesting extras. 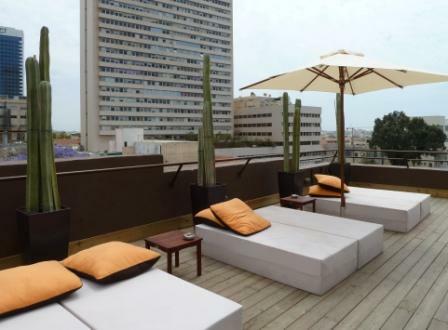 There’s a rooftop sundeck, perfect for those who prefer to catch rays without engaging with Tel Aviv’s beaches, just five minutes walk away, and an indoor-outdoor chill lounge which is a delight both day and night. Freebies include bicycles, perfect for exploring the interesting neighbourhood surroundings – a bike ride down Rothschild is a special delight – coffee and cake in the lobby, and free access to a gym to work the cake calories off!